History has a funny way of changing over time as we change. Many have spoken loudly against Revisionist History, and rightly so, for it can exclude, modify, or outright distort what actually happened. But we should also remember that even those present at an event have a less than 100% accurate recollection of the happening. 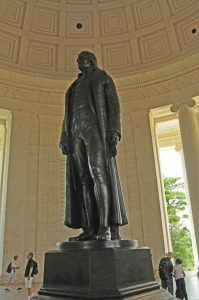 Those supporting freedom of religion in America rightly hold up Thomas Jefferson as a champion of that cause, for he was the author of The Virginia Statute for Religious Freedom which he drafted in 1777. In it he clearly articulated the rights of the individual to believe and practice as his conscience dictated. In this he included his objection to any tax that would favor one religion above another. But we must remember that when Jefferson penned these words he did so in an America that had strong Judeo-Christian roots and affiliation, almost to the exclusion of ideas coming from other world religions. Over the years we have become increasingly cosmopolitan, and with this diversity of cultures has come an assortment of religious ideas. It appears that this was not part of Jefferson’s thought pattern when he wrote this document. This becomes apparent when we notice the concluding sentence included as an addition to the northwest panel in the interior of the monument honoring him: “I know but one code of morality for men whether acting singly or collectively.” This sentence was taken from a letter he wrote to James Madison in 1789 and not part of his Virginia bill. Its inclusion on this panel is a type of Revisionist History in its own right. 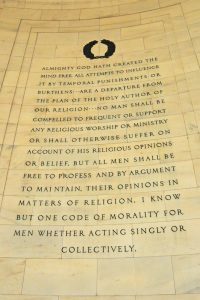 Our challenge today is to uphold a belief system based upon the idea that the only religion worth having is one that is freely chosen, even if that means extending that freedom to those who see no value in the Ten Commandments Jefferson alluded to. Should we expect increasing disregard for the Decalogue? Of course. That’s the costly price freedom pays. But for those who hold it sacred, that’s what makes it even more important as an identifying mark of who we are.